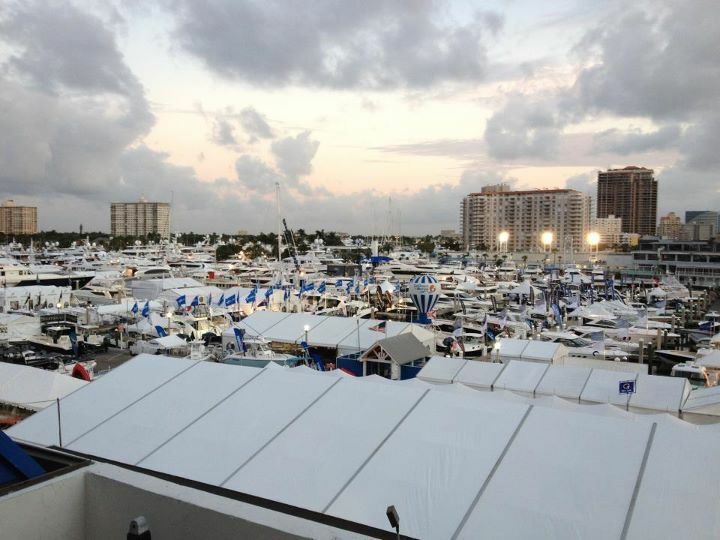 Rain dampened this year’s Fort Lauderdale International Boat Show which ran from last Thursday until Monday, October 31st. Monday morning I awoke at 5:30am to flooded streets and stalled sedans littering Federal Highway. But in general there was enough clear weather for another optimistic show. Highlights for me included the Raymarine E7 series, PassageMaker seminars, and pride in the status of my home city. There have been many good choices made by people in Fort Lauderdale to encourage luxury yachts, brands, and people to populate the area. From what once was a cruising waypoint, Fort Lauderdale has become the world’s megayacht capital, and FLIBS is probably the most striking example of the benefits of this approach. I am often reminded of our positive position by other brokerages who envy our location and pine for the inventory of yachts available in town. Talking to old timers about the hey days of Miami as a yachting hub constantly keeps me sharp on helping prevent Fort Lauderdale from loosing our position. Thirty years ago, Fort Lauderdale was like Fort Pierce or Saint Petersburg is today, and most the yacht industry was located in Miami such as Merrill-Stevens. A year or so ago, Merrill-Stevens went bankrupt, but Miami’s fortunes had fallen many years earlier. Nevermind the cause, Miami is seen these days as a third world country in terms of yacht service and storage with lower quality workmanship, higher rates of crime, and a blighted infrastructure. What we must do in Lauderdale to maintain our position is keep investing in projects such as the renovation of Bahia Mar and attracting the class of businesses which seek to provide high quality products or service. Any drop in our level and events such as FLIBS could shift north to Stuart and leave us to repeat the history of Miami’s yachting industry. If you were able to attend FLIBS ’11, I hope you left with a good impression of Lauderdale and come back on your yacht and stay awhile.